I just wanted to post a quick note about a few of the changes I just made with the Safelist Marketing Tactics ebook and website. As you know things in this industry moves very fast. I hate the idea of having my books floating around out there with outdated information. So maybe twice a year I like to go back and make revisions to keep the content fresh. I’ve added two new mailers to the list of recommended sites. If you have been following my monthly safelist stats it should come as no surprise which two they are. If you are an upgraded member of the SMT website please login and add your referral links to the rebrander to make sure you have the most recent edition. I’ve also added two new video splash pages that you can use to promote the SMT website. You may have seen my “3 Stooges” and “Video of Me Talking” splash pages before. I made these pages for my own personal use but after getting many requests I have now added them to the members area. These pages convert like crazy! Free members earn 25% commission on all upgrades and OTO purchases. There is a complete list of promo tools available inside the SMT members area. If there is anything you would like to see added in future updates feel free to let me know. Autoresponder Profit System is LIVE! I have a new ebook and website! Yep, after nearly a year of working on it today I am finally releasing my new ebook called “Autoresponder Profit System“. Like all of my other ebooks this one is free and there is an affiliate program to go along with it so that you can make some extra cash by giving it away. Of course there is also the option to rebrand the book with your own affiliate links which will allow you to make even more money when people sign-up for the programs recommended in the book. Autoresponder Profit System is my “list building” ebook but with my own little slant on the subject. I actually created it for people who may already have an autoresponder but might not know how to use it to build a list. More importantly, it will show people how to “profit” from their autoresponder either by using it to promote various affiliate programs or by bringing more members into their primary business that they are already promoting. Autoresponder Profit System also makes a great giveaway for people who already have downline members in an autoresponder. So giving them this book greatly improves the chances that they will actually start making some money with their autoresponder thus keeping them in your downline every month. I just checked my site stats. The site launched an hour ago and already there are close to 200 members! Whee! I suspect I am going to be a little busy for the rest of the day but I would love to read your comments about the book. 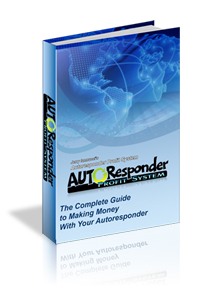 Please click on the link below to download your free copy of Autoresponder Profit System and let me know what you think! 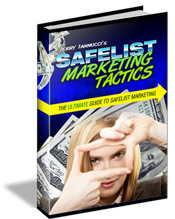 Safelist Marketing Tactics is 1-Year Old! Hello! I’m back. Sorry I have been kinda quiet lately but I have been busy putting together some new projects while I will be announcing very soon. For example… You might have noticed that over the last year I have been working very hard to brand myself as “the safelist guy” and it all started with a little ebook and website that I created called “Safelist Marketing Tactics“. Well, it’s been 1-year since I released SMT so I thought now would be the perfect time for a relaunch of Safelist Marketing Tactics! to learn new and more effective ways to market with safelists. I’ve now updated the book to include more current content including more submission strategies, more information about vial list builders, and a few changes to the recommended programs list. Upgraded members will now have the ability to upload a photo and submit their autoresponder code to create their own personalized squeeze page (created by the great Winter Perkins). There’s also a 5-part email series which you can use to promote your own programs that also encourages upgrades at the SMT website. I updated the “Thank You” ad. I hated the old one. This one is much better. I also added a few new promo emails which have been converting well for me lately. I updated the OTO page to include some really nice video packages included which I think will convert really well with new safelist marketers. I also reset the OTO for the first time since I launched the site. Considering it’s been a year since I reset the OTO you might want to pay attention the next time you see it. I may never reset it again. I’ll be posting daily updates of the contest inside the members area. If you are already a member of Safelist Marketing Tactics I thank you for all the support and positive and feedback I have received over the past year. Please login now to check out all the new features. I think you’ll enjoy it. If you’re not a member yet… what are you waiting for? It’s free and it’s better than ever. Click the image below to grab your free copy of Safelist Marketing Tactics. Welcome back to part 3 of my money making series. A few days ago we started talking about list building as a way for you to make money working from home on the Internet. For myself and many others this has been the key to our Internet marketing success. Today I want to share with you the step-by-step system that I use to make money with my list every day. However, instead of trying to explain it all in this blog post I am going to refer you to an ebook instead. Sorry. No sense in me trying to reinvent the wheel when all this information is already out there readily available. If you are looking for a step-by-step system to building a profitable opt-in mailing list there is no better place to start than Soren Jordansen’s “Internet Marketing Success Formula”. Save it to your computer and then take some time today to read the whole thing. Don’t just skim… read it! Next time I won’t take the easy way out and i’ll show you some techniques you can use to create your own mouth watering freebies that can be given away to build your list. Look for it in a few days. As you may or may not know I make most of my money online doing affiliate marketing. That means I promote other people’s stuff and I earn money every time somebody I refer buys something. The problem with affiliate marketing though is that while there are thousands of free programs out there for people like me to promote it seems like most people who are new to the business have a hard time trying to figure out exactly where to start. Last week my good friend Ryan Hogan gave me a sneak peak at a new book that is he releasing today called “Affiliate Jumpstart”. Ryan does a great job in his book of covering every aspect of affiliate marketing including how to find the best high paying affiliate programs, how to drive traffic to them, and most importantly how to convert that traffic into sales. Normally I would just send you my download link to get the book (it’s on my blog somewhere if you want to hunt for it) but this is one of those sites that you really should join. Because not only will you get access to the ebook but you will also get 3 customizable squeeze pages and a pre-written autoresponder series that you can use to start building your list today! Also, if you’re an action taker and want to really make a big difference in your bottom line, you’ll definitely want to check out Ryan’s upgrade offer. With it you can make insane commissions, access high quality training videos and you can load up his powerful ebook up with over 35 of your own affiliate IDs for some of the best affiliate programs out there and push your commissions into overdrive! The site is launching today so you get to be one of the first people to try it out. Click link below to join now!